If you’re looking for the best quality Omega 3 fish oil, with the highest levels of EPA & DHA, no heavy metals or nasty contaminants and a great taste – look no further. 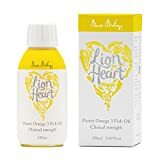 Lion Heart’s the only fish oil in the UK with 3,000mg of EPA & DHA in a single spoon (2,000mg EPA + 1,000mg DHA), the recommended daily dose for lowering blood pressure. It’s also the only British brand certified by the International Fish Oil Standards. It’s one in only a handful of natural triglycerides and as you’ll see from our reviews, it tastes really good. It’s the best quality by far, which is why it’s stocked in Liberty London & Space NK and recommended by Nutritional Therapists. It’s the one upgrade to your health that is worth the investment, and Lion Heart is great value for money because it’s so concentrated.